Last week, I wrote about our work in Stockton collaborating with the city and local community groups to create the building blocks for a more resilient Stockton, using funds made available by California’s climate laws. I mentioned that SB 1072 (Leyva) holds the key to helping other communities build capacity and sustainability locally. This week, I want to share more about SB 1072, a bill that we’re co-sponsoring this year along with the Trust for Public Land. SB 1072 would build out and scale up the capacity building and technical assistance infrastructure needed in California’s most impacted communities. For many communities like Stockton across the state, the process of getting clean energy funds and putting them to work is difficult, technical and cumbersome. For wealthy communities, that’s no big deal. But the communities that need the money the most don’t have the resources to jump through all those hoops. We can fix this. 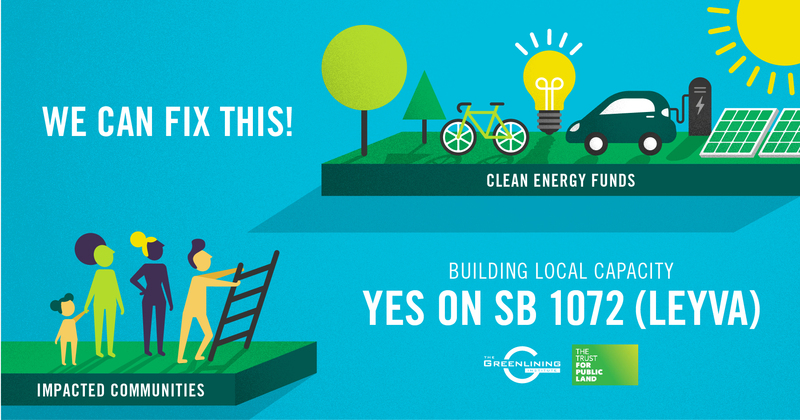 SB 1072 levels the playing field so that under-resourced communities get a fair shot at urgently needed dollars to make their neighborhoods cleaner and greener. It’s supported by nearly 100 organizations and has no organized opposition. This is simple common sense; let’s get it done. Regional climate collaboratives to be the local hubs, staffed by local experts, to spread the word, answer questions, convene community members, foster partnerships and help to develop project ideas. We see this as vital capacity building work to support stakeholders like community-based organizations and local governments. We can’t afford to leave anyone behind. Low-income communities of color breathe the dirtiest air and suffer the most from climate change. The state must make a commitment to supporting our communities with the tools and resources necessary to act locally on climate. SB 1072 is awaiting a vote on the Assembly floor anytime this week. From there, it will need to go back to the Senate for concurrence, and will need to pass out of the legislature by August 31. From there, the bill will need to be signed by Governor Brown by September 30. Call your Assemblymember and ask them to support SB 1072.